This starling sized bird is often unobtrusive despite its bright colours, and often all that is seen is a glimpse of a bright blue back flying off over water. On the other hand this shy bird can allow really close clear views, if you are patient. In recent years, sightings on Arran have been after the breeding season, as winter is approaching, when birds disperse to be nearer the milder coast. There are no confirmed breeding records of Kingfisher on Arran. In September there were three reports of Kingfisher on Arran, one on Wednesday 16th in the Fisherman's Walk area in Brodick, one on Friday 18th in the Cordon area of Lamlash and one on Saturday 26th over the Rosa Burn by the museum in Brodick. These were the first records for 2009. In 2008 there were no records between March and September. In recent years there have been reports from many parts of the coast around Arran including Blackwaterfoot, Lamlash, Lochranza and even the pier at Brodick. 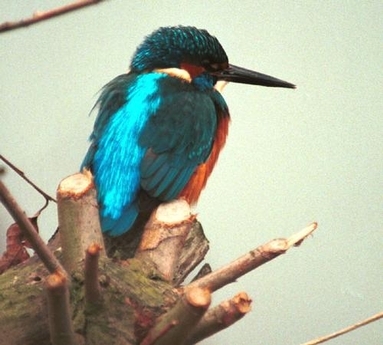 In Scotland, the Kingfisher is a localised breeder found mostly in the south and west mainland. The range of this species is from the British Isles and Scandinavia east across central Europe to the Urals and the Caspian Sea. Populations in the north and east undertake long distance migrations to winter in southern Europe and North Africa, but birds further west and south are either sedentary or short distance migrants. Wherever the birds on Arran come from their presence brightens any day.